This is a C++ library directly analogous to ETHZ ASL's GridMap library, but designed for use with costs where the data element is an unsigned char (as opposed to grid_map's doubles). cost_map : meta-package for the grid map library. cost_map_core : core interfaces and algorithms of the cost map library, this package has no ROS dependencies. cost_map_ros : converters and utilities for cost maps in a ROS ecosystem - Image Bundles, CostMap2DROS, OccupancyGrid, CostMap messsages. cost_map_cv : conversions from and to OpenCV image types. cost_map_msgs : ROS message definitions related to the cost_map_msgs/CostMap type. cost_map_visualisations : helper nodes that bridge cost maps to RViz. cost_map_demos : several nodes for demonstration purposes and a test suite. 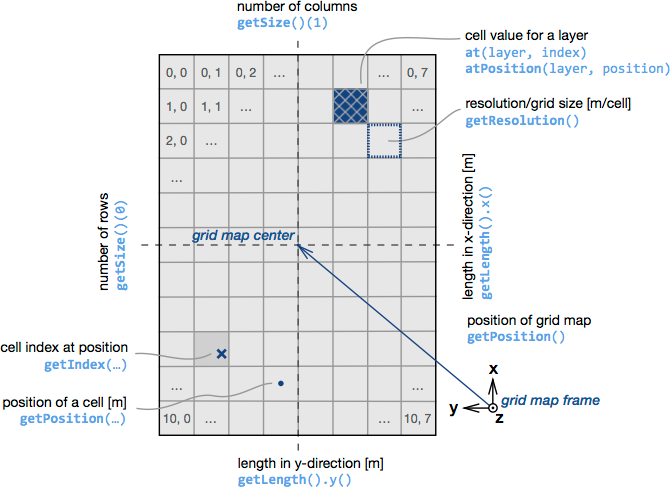 The core cost_map::CostMap class is designed to maintain as close a compatibility to grid maps as possible. This compatibility extends to conventions, definitions and API. For convenience, an illustrative reference of a few of the conventions that hold for both cost maps and grid maps is provided below. Please refer to the GridMap README for a more comprehensive outline of what is possible with cost maps and grid maps. 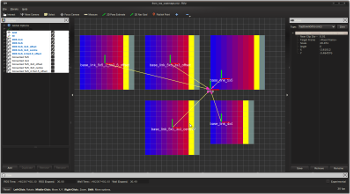 As with grid maps, the method employed to visualise is to drop in a relay node between the cost map publisher and rviz to convert it to the appropriate type for visualisation. This spares you from having to write any gui-related code in the cost maps or the planners/controllers that use the cost maps. An example of a relay in action is in the image bundle demo below. Image bundles provide an easy way to load and save cost maps to and from files on disk. An image bundle consists of data stored in two parts - 1) meta-information about a costmap in a yaml file and 2) layer data that is stored alongside in grayscale images. See cost_map_ros/image_bundles/example.yaml for a real example. See the LoadImageBundle/SaveImageBundle classes which illustrate how the command line utilities use these api. The ROS Navistack uses costmap_2d::Costmap2DROS objects and it is sometimes necessary to make conversions from these to provide new style cost maps to other libraries. Methods are available for both full map conversion as well as subwindows centred on the pose of the robot itself. See the from_ros_costmaps demo program which illustrates how to use these api. Additionally you can directly use the grid_map::Costmap2DConverter template class for more atomic operations. See the inflation demo program which illustrates how to use these classes.